Waterborne paint with excellent whiteness and great coverage. It allows for the breathability of ceiling surfaces. Exceptionally useful in areas with concentrated water vapours. In this way it prevents water vapour accumulation and condensation forming on the ceiling surfaces. 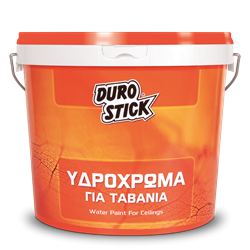 Uniquely suitable for ceilings without waterproofing protection, such as kitchens and bathrooms, bedrooms etc. Affortable solution for warehouse and stairway applications. It does not create paint lapping marks or brush marks. Available in white that can be colored in 120 colors using DUROCOLOR, the Measuring System for Shade Rendering in 20ml syringe packaging. 1kg/5-6m2 per coat, on properly prepared surfaces.